I was young. I was struggling with my sexuality. I did not know what to do with my life. I had no one to turn to but books and that’s exactly what I did. That gave me the much needed solace, the balm to my pains. And that is the time I read Raj Kamal Jha’s “The Blue Bedspread” that made a big difference to my existence. I think that some books do that to you. They change your world and you are forever indebted to them. The book was not a bright book. It was not a happy book either. It was raw and real and that helped me, like no other book at that time. 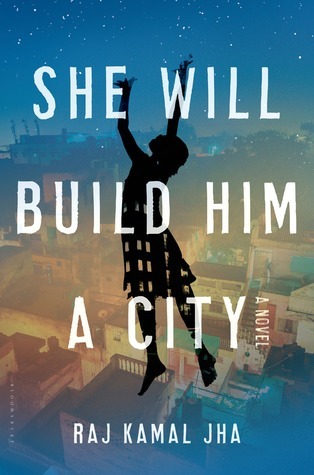 And he is back again with his new book (though there have been two more since The Blue Bedspread), “She Will Build Him A City” which has all the hallmark elements of his writing style – pathos, irony and depiction of the “real” India. It is a story, running on three tracks and how they merge and blend beautifully into one large landscape of a tale. In Delhi, a mother spins a tale for her daughter, now grown-up. She wants to make her daughter whole again, who is broken and she doesn’t know how to do that. In another part of the city, a new-born is left outside an orphanage and his story begins from there. On the third side, a man is out on a mission to kill and dreams of murder. These are the three threads that merge exquisitely in this book. The writing will take your breath away and want you begging for more. I think what Jha does so wonderfully is make things as real as they are. There are no frills and at the same time you know that there is redemption for these characters – these creatures of circumstance. Every scene is an imagery that is conjured by the mind and to me that is great writing. Anything which can make me imagine or think of the characters’ lives and what they might be doing as of now. “She Will Build Him a City” does not move at a fast pace. The book is not supposed to. It takes its time and as a reader, it makes you patient as well. This book will make you see India in a different light. It will also make you see love and all its forms differently. This entry was posted in Bloomsbury Publishing, Books, Literary Fiction, Raj Kamal Jha, Review and tagged bloomsbury, delhi, Gurgaon, literary fiction, Raj Kamal Jha, She Will Build Him A City, The Blue Bedspread on February 1, 2015 by thehungryreader.